Porcelain dental crowns are extremely durable, however, they may require replacement at some point in the future. Porcelain crowns typically have a lifespan of ten years but may last for a longer or shorter period of time based on how well they are cared for. Taking proper care of porcelain crowns can help ensure a long lifespan while neglecting oral health may cause damage to porcelain crowns. 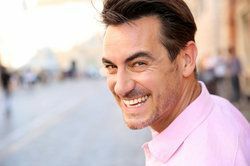 Albuquerque cosmetic dentistry patients can ensure a long lifespan for their porcelain crowns with these helpful tips. What Affects the Lifespan of Porcelain Crowns? Porcelain crowns will last many years if cared for properly. Poor oral hygiene can leave the natural teeth vulnerable to decay, even teeth covered by dental crowns. Bad oral hygiene habits can cause damage to the tooth roots, which can lead to tooth loss or crown damage. Chewing on hard items like ice and plastic pen caps can crack dental crowns and shorten their lifespan. Porcelain crowns are rather durable, however, practicing special care can help prolong the life or your porcelain crowns. Practicing proper oral hygiene is one of the most important factors to ensuring a long lifespan for dental crowns. Keeping the gum line clean is especially vital when it comes to porcelain crowns since the natural tooth is not covered by the crown beneath the gum line. The natural tooth can become damaged if proper oral hygiene is not practiced and may lead to crown damage. Practice proper brushing habits: Brush your teeth at least twice a day for at least two minutes at a time. While brushing, be sure to pay special attention along the inner and outer gum line. Floss at least once a day: Floss at least once a day to help remove any plaque and bacteria, which may gather between the teeth and along the gum line. See your dentist for regular checkups: See your dentist for regular checkups to keep your teeth and gums healthy and to make sure your dental crown is structurally sound. Seek dental care at the first signs of crown trouble: If you notice any problems with your dental crown, be sure to see your dentist as soon as possible. This can help prevent any minor problems from escalating. Avoid chewing on hard objects: Though porcelain crowns are very durable, you can help prolong the life of your crowns by avoiding chewing on hard objects like ice and pen caps. To see if dental crown treatment is right for you or to find out more about other cosmetic and restorative dental treatments, we welcome you to schedule an appointment with Dr. Wall today.